And welcome to the Holiday Home Linky Party! 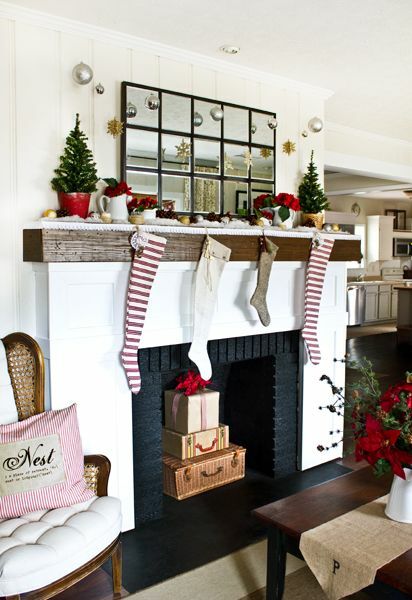 Today’s party is all about merry mantels- because if you’ve been reading our blog for more than a couple months, you know how much I love a good mantel makeover! We’re totally lovin’ the way it all turned out, but I’m not gonna lie, that DIY Pottery Barn Eagan mirror project we built was a bit of a beast! But I’ve always wanted that thing, and we saved about $600 by building our own version of it. There were, however, several steps involved in its creation. And although we planned to photograph each and every one of them so that we could do a step-by-step tutorial here on our blog, we were in such a hurry to finish it, we ended up abandoning our camera after step #4 so that we could just hurry up and git r’ dun. That being said, we will definitely be vlogging about how we made it sometime this (or next) week. It’ll be waaaaay easier for me to explain it all on video! It really wasn’t hard, there were just a lot of steps. The little, red, metal bucket ($5.95) came from Tobacco Barn in Asheville, North Carolina. The seagrass pot ($4.99) came from Ikea sometime earlier this year. The pleated, white trim across the top edge of the mantel, the tiny trees, and two red hydrangeas (which I split up into four) came from Hobby Lobby (Trees- $2.50/each, Hydrangea stems $3/each). 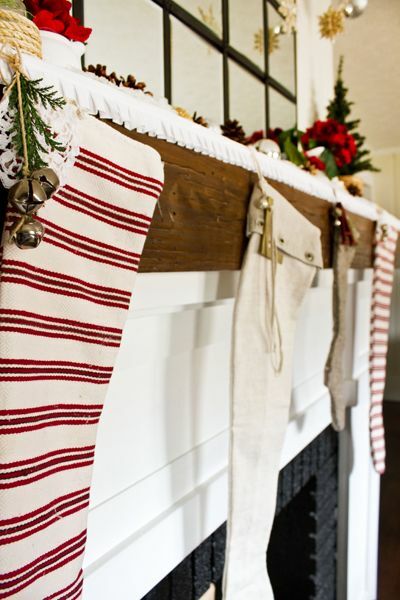 The faux snow, pinecones, white pitchers, rope-wrapped candles, all came from mantels-past. Down in the firebox, we used a basket we got from the gals at Whiteflower Farmhouse a while back- and a suitcase we picked up at Seaside Sisters on Tybee Island. The “present” on top is actually one of my Ikea baskets wrapped in some brown Kraft paper and a piece of red and white striped ribbon I had. I topped it with a faux poinsettia and some pinecones I had in my Christmas decor stash. I almost hate to have to take it all down after Christmas! But you know me, once Spring rolls around, I’ll more than likely be in the mood to mix it up again. But enough about our mantel…it’s your turn now! 1.Scroll down til you see the “add your link” button. Click that, and create a descriptive name for your link. This will make it easier for folks to browse through them. 2.Make sure to link to your specific holiday mantel post, not the main page of your blog. Thanks in advance for linkin’ up and hope to see you at Rhoda’s vignette linky party this Thursday, Kate’s craft linky party next Tuesday, and Sarah’s tree linky party next Thursday! Unfortunately I do not have a mantel in my new home (I’ve played around with the idea of DIYing a faux fireplace and mantel but it’ll be some time before that get’s done) so for now I’ll oooh and aaaah over your linky party mantels and absorb some inspiration from them. 🙂 It’s going to take me all day to check out the rest of them but I’m going to try and view as many as I can. I joined your mantle party. Lots of inspiration here. Your mantle is gorgeous. The mirror is awesome. Thanks for allowing us to share our inspirations with you and others involved in the blog world! It’s nice seeing everyone else’s creative mantles! Your mantle is beautiful, of course! Happy Holidays to you and your family! Oh how I wish I had a mantel. I would really decorate it in white this year. Thank you for sharing your life with us. I read every post and love your style! Thanks for the party! 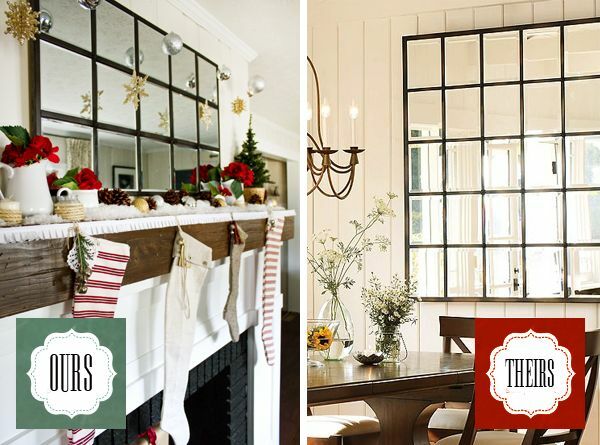 Love your mantel and all of your ideas! Thank you for sharing, I am always excited to see your new creations! All of your seasonal mantles are SO BEAUTIFUL! What talent you have! I linked up yesterday and only got through maybe one third of all the link ups – so much inspiration. I am going to have to get my act together fast to link up with Rhoda tomorrow! Your mantel always looks wonderful. Funny thing going thru the links. Mantel/Mantle can be spelled correctly two ways. I am a mantel girl. What an inspiration from a beautiful & talented Lady – Layla! I can wait for your vlog about the Pottery Barn mirror. I would kill for the one at PB but if I could DIY it, it would mean a lot more to me. 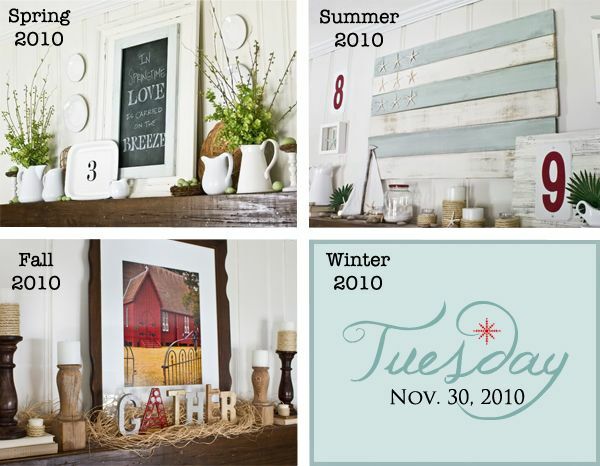 DIY items are so much more cherished and special! Love your mantel as well! I like the vignette inside the fireplace! Okay, I am late and last but that’s okay!!! I’m here! Thanks for hosting and love all the beautiful and creative ideas! Wow I can’t believe all these fantastic mantels! Each more beautiful than the last. Thank you for organizing this linky! Love all the mantels! I don’t have one, or I would link up, too. The Bavarian Christmas linky party is now open-wonâ€™t you come and join us at http://dobermans-by-the-sea.blogspot.com/2010/11/1st-christmas-linky-party-at-dobermans.html and while you are there join the give-a-ways going on. I seriously considered purchasing that PB mirror on several occasions. Can’t wait to see the vlog on how you accomplished your version. I love these! 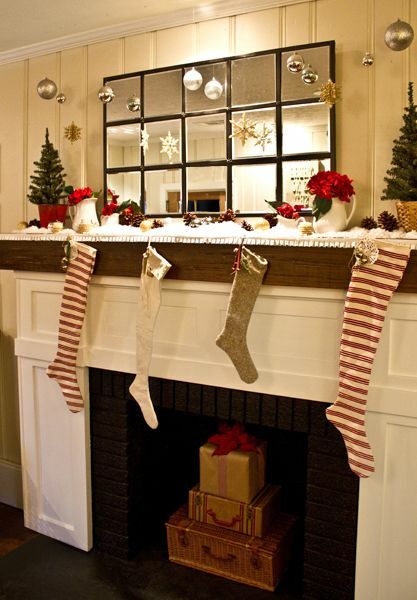 Wonder if you know anywhere there is a linky party for mantels for the rest of the year? I have a new house and am lacking inspiration! Thanks for sharing all of your brilliant and beautiful designs for those of us who are less creative! Your mantel is just lovely! I knew it would be, as you always have such wonderful ideas. I have joined your party and am having a great time checking out all the mantels. Thanks for hosting this party and inspiring us all. I love it all! Those stockings are fabulous. Thanks for hosting the party. I hope I can get a move on and join in time. AHHH…Dying that you made the mirror! I’ve wanted (and started to attempt) to make that mirror but couldn’t figure out how to do it! I think my biggest problem was the size I was trying to do and how I would make it stable. (I think the amount of mirrors I had made it wider than 4′ so that seemed problematic when sheet goods are 4×8) Then I wasn’t sure I’d found the best size of mirrors…oh please please share how you did it! I can’t wait! I love your mantle! Hope you don’t mind if I show it on my blog…we’re moving this week, so everything holiday is still packed away. Since I can’t post about decorations in my own home this year, I highlighted a few I found in others! What a fun party! Glad I joined in! How festive and cozy everything looks! Between these photos and the seasonal COLD weather we now have, you helped jump start me into the frenzy. Thanks for hosting this mantle decorating party. I participate merrily! Thank you for hosting this wonderful party! It is so much fun! Your mantel is beautiful! Joining the mantle fun a little late but I can’t wait to see what everyone else has done! Love your stockings Layla! Lovely collection of mantels! I guess, I forgot to read the fine print, as this collection is closed. Opps! Here’s my mantel anyway…thanks for the inspiration!! I loved your mantel, it’s really so nice and simple with lots of elegance. I tried to enter your Mantel Party but couldn’t find the link, or am I to late? I forgot to tell you… you can visit my blog anytime, you’re very welcome. I’ll be waiting for you as I like what you do Layla. I simply love that mirror and think it would look so great on my mantel b/c the wall above my mantel isn’t very tall. Can’t wait to hear about the details and hopefully it’s something I can try!